Android introduces a new state into the power management state machine, called deep sleep. 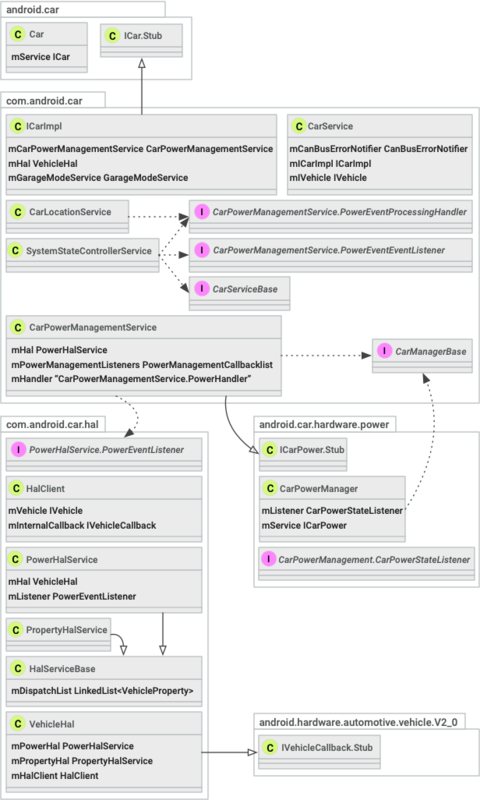 To implement deep sleep, Android provides a CarPowerManagementService service and a CarPowerManager interface. State transitions are triggered by the Vehicle Master Control Unit (VMCU). To communicate with the VMCU, Integrators must implement several components. Integrators are responsible for integrating with the Vehicle Hardware Abstraction Layer (VHAL) and the kernel implementation. Integrators are also responsible for disabling wake sources and ensuring that shutdowns are not postponed indefinitely. Application Processor (AP) Part of the System on a Chip (SoC). Board Support Processor (BSP) All of the chip and hardware specific code necessary for the product to work. Typically provided by the SoC vendor and hardware manufacturer. This covers items such as device drivers, the PMIC sequencing code, and SoC bringup. CarPowerManager (CPM) Exposes an API for applications to register for power state changes. 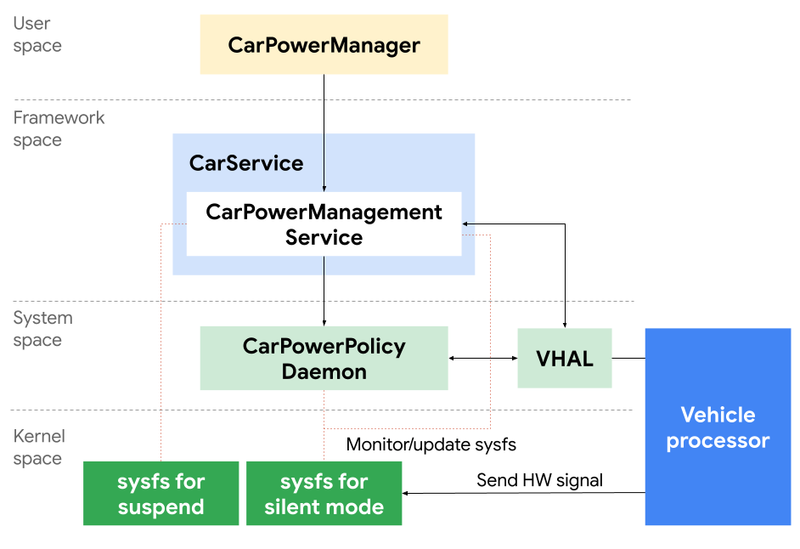 CarPowerManagementService (CPMS) Implements the car power state machine, interfaces with VHAL, and performs the final calls to suspend() and shutdown(). CarServiceHelperService (CSHS) Provides a hook into SystemServer for OK, provided that is the Car Service. General Purpose Input/Output (GPIO) A digital signal pin for general purpose use. Hibernate Also referred to as Suspend to Disk (S2D/S4). The SoC is placed into S4 power mode (hibernate) and RAM content is written to non-volatile media (such as flash or disk) and the entire system is powered off. Android does not currently implement hibernate. Media Processor (MP) See System on a Chip (SoC). Power Management Integrated Circuit (PMIC) Chip used to manage power requirements for the host system. System on a Chip (SoC) Main processor that runs Android, typically supplied by manufacturers such as Intel, MediaTek, Nvidia, Qualcomm, Renesas, and Texas Instruments. Suspend Also referred to as Suspend to RAM (S2R or STR). The SoC is placed into S3 power mode and the CPU is powered off while RAM remains powered on. 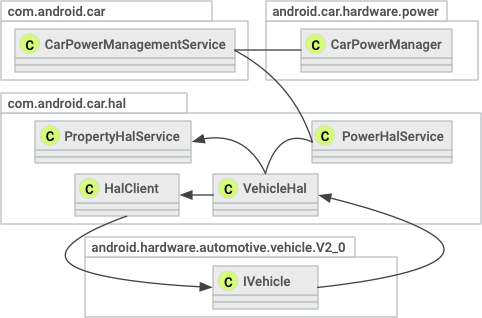 Vehicle HAL (VHAL) The Android API used to interface with the vehicle network. The Tier 1 partner or OEM is responsible for writing this module. The vehicle network can use any physical layer (such as CAN, LIN, MOST, and Ethernet). The VHAL abstracts this vehicle network to enable Android to interact with the vehicle. Vehicle Interface Processor (VIP) See Vehicle MCU. Vehicle Master Control Unit (VMCU) The microcontroller that provides the interface between the vehicle network and the SoC. The SoC communicates with the VMCU via USB, UART, SPI, and GPIO signals. This section describes how Android represents the application processor's power state and which modules implement the power management system. This material also describes how these modules work together and how state transitions typically occur. The initial state of this state machine is OFF. This state can transition into two states, ON: DISP OFF and ON: FULL. Both states indicate that the AP is on. The difference lies in the display's power state. ON: DISP OFF means that the AP is running and displays are turned off. When the display turns on, the ON: DISP OFF state transitions into ON: FULL (and vice versa). When the power management state machine enters the DEEP SLEEP state, the AP runs Suspend to RAM. For example, the AP suspends its state (such as register stored value) in RAM. When the AP wakes up, all states are restored. CarPowerManagementService Coordinates the Sleep/Suspend power state. Vehicle HAL Interface to the VMCU. libsuspend Native library to place the device into suspend. Kernel Suspend to RAM implementation. The deep sleep feature (suspending Android to RAM) is implemented in the kernel. This feature is exposed to the user space as a special file located at /sys/power/state. Android Auto is suspended by writing mem to this file. libsuspend is a native library that implements forcesuspend(). This function uses /sys/power/state to suspend Android Auto. forcesuspend() can be called from system services, including CPMS. The CPMS coordinates the power state with other services and HALs. The CPMS implements the state machine described above and sends notifications to every observer when a power state transition occurs. This service also uses libsuspend and the VHAL to send messages to the hardware. Only the VMCU can initiate deep sleep. Once deep sleep is initiated, the VMCU sends a notification to the CPMS via the VHAL. The CPMS changes the state to SHUTDOWN PREPARE and broadcasts this state transition to all observers (the applications and services that monitor CPMS) by calling the onStateChanged() method with a new state ID provided by the CPM. The CPM mediates between the applications/services and the CPMS. The onStateChanged() method for the applications/services is synchronously invoked in the CPM's onStateChanged() method. After which, the finished method of the CPMS is invoked to notify the CPMS that the target application or service is ready to suspend. The CPM's onStateChanged() method runs asynchronously. Therefore, some delay occurs between the calling of the onStateChanged() method to all CPM objects and the receiving of the finished message from all these objects. During this time, the CPMS continues to send shutdown postpone requests to the VHAL. Once the CPMS receives the finished message from all CPM objects, the CPMS sends AP_POWER_STATE_REPORT to the VHAL, which then notifies the VMCU that the AP is ready to suspend. The CPMS also calls its suspend method, which suspends the kernel with a feature provided by libsuspend. 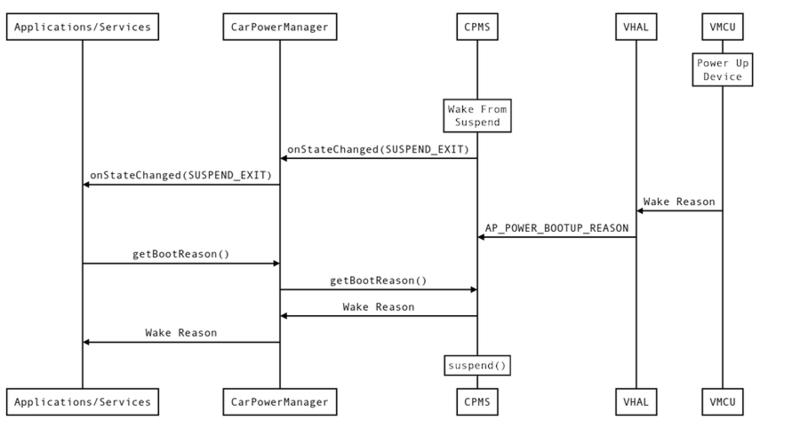 The sequence to exit suspend is also initiated by the VMCU. The VMCU turns on the AP and the AP restores the suspended Android from RAM. The CPMS uses onStateChangedmethod to send a SUSPEND_EXIT message to applications and services when it wakes up. Monitor power state changes in the AP. Acquire boot reasons from the CPMS. Request the VMCU to shut down the AP on the next suspend instruction. To acquire the CPM instance, call the Car API. Call the appropriate method on the object created in Step 1. To create a CPM object, call the Car object's getCarManager() method. This method is a facade used to create CM objects. Specify android.car.Car.POWER_SERVICE as an argument to create a CPM object. SHUTDOWN_CANCELED Shutdown is canceled and power state is returned to the normal state. SHUTDOWN_ENTER Enter the shutdown state. Applications are expected to clean up and be ready to shutdown. SUSPEND_ENTER Enter the suspend state. Applications are expected to clean up and be ready to suspend. SUSPEND_EXIT Wake up from suspend or resume from a cancelled suspend. BOOT_REASON_USER_POWER_ON A user presses the power key or rotates the ignition switch to boot the device. BOOT_REASON_DOOR_UNLOCK Door unlocks, which causes the device to boot. BOOT_REASON_TIMER Timer expires and vehicle wakes up the AP. BOOT_REASON_DOOR_OPEN Door opens, which causes the device to boot. BOOT_REASON_REMOTE_START User activates remote start. This method throws a CarNotConnectedException when it fails to communicate with the CPMS. The requestShutdownOnNextSuspend()method instructs CPMS to shut down instead of deep sleep at the next opportunity. Kernel interface to suspend Android. Propagate the initiation of suspend or shutdown from the car to Android. Send the shutdown ready message from Android to the car. Initiate shutdown or suspend of Android via the Linux kernel interface. Propagate the wake reason from the car to Android upon resume from suspend. Wakesources to be disabled when the device is in suspend. Applications to shut down quickly enough so as not to indefinitely postpone the shutdown process. First, implement the Linux suspend power state. Android places a device into suspend mode when an application or service writes mem into a file located at /sys/power/state. This function may include the sending of a GPIO to the VMCU to notify the VMCU that the device has shut down completely. The Integrator is also responsible for removing any race conditions between VHAL sending the final message to the VMCU and the system going into suspend or shutdown mode. Propagates the initiation of suspend or shutdown from the car to Android. Sends the shutdown ready message from Android to the car. Initiates the shutdown or suspend of Android via the Linux kernel interface. Propagates the wake reason from the car to Android upon resume from suspend. When the CPMS informs the VHAL that it is ready to shut down, the VHAL sends the shutdown ready message to the VMCU. Typically, on-chip peripherals such as UART, SPI, and USB transmit the message. Once the message has been sent, the VHAL calls the kernel command to suspend or shutdown the device. Before doing so, in the case of a shutdown, the VHAL or BSP may toggle a GPIO to instruct the VMCU that it is safe to remove power from the device. AP_POWER_STATE_REPORT Android reports state transitions to the VMCU with this property, using VehicleApPowerStateSet enum values. AP_POWER_STATE_REQ The VMCU uses this property to instruct Android to transition to different power states, using VehicleApPowerStateReq enum values. AP_POWER_BOOTUP_REASON The VMCU reports the wake reason to Android, using the VehicleApPowerBootupReason enum values. int32Values: VehicleApPowerStateReport enum of the current state. int32Values: Time in milliseconds to postpone or sleep/shutdown. This value depends on the first value. The first value can take one of the following values. Types.hal contains more specific descriptions, which are stored in the hardware/interfaces/automotive/vehicle/2.0. BOOT_COMPLETE AP has completed boot up and can start shutdown. DEEP_SLEEP_EXIT AP is exiting the deep sleep state. DISPLAY_OFF User has requested to turn off the display of the head unit. DISPLAY_ON User has requested to turn on the display of the head unit. The state can be set asynchronously (in the case of BOOT_COMPLETE) or in response to a request via the VMCU. 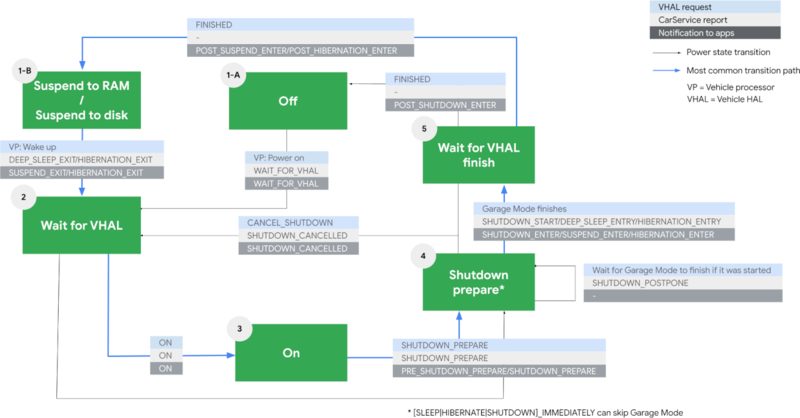 When the state is set to SHUTDOWN_START, DEEP_SLEEP_ENTRY, or SHUTDOWN_POSTPONE, an integer (in milliseconds) is sent to notify the VMCU for how long the AP must postpone shutdown or sleep. int32Values: VehicleApPowerStateReq enum value, which represents the new state into which to transition. int32Values: VehicleApPowerStateShutdownParam enum value. This value is sent only for a SHUTDOWN_PREPARE message and transmits to Android the options it contains. OFF AP is turned off. DEEP_SLEEP AP is in deep sleep. ON_DISP_OFF AP is on, but display is off. N_FULL AP and display are on. SHUTDOWN_START AP is starting shutdown. The VMCU can turn on the AP after the time specified in the second value. SHUTDOWN_PREPARE The VMCU has requested the AP to shut down. The AP can either enter sleep state or start a full shutdown. SHUTDOWN_IMMEDIATELY The AP must shut down immediately. Postpone is not allowed. CAN_SLEEP The AP can enter deep sleep instead of shutting down completely. SHUTDOWN_ONLY The AP can only shut down when postponing is allowed. USER_POWER_ON Power on because the user pressed the power key or rotated the ignition switch. USER_UNLOCK Automatic power on triggered by a user unlocking a door (or any other type of automatic user detection). TIMER Automatic power on triggered by a timer. This occurs only when the AP has requested wakeup after a specific duration, as specified in VehicleApPowerSetState#SHUTDOWN_START. Use Integrator to disable the appropriate wake sources when the device is in suspend mode. Common wake sources include heartbeats, modem, wifi, and Bluetooth. The only valid wake source must be an interrupt from the VMCU to wake up the SoC. This assumes that the VMCU can listen to the modem for remote wakeup events (such as remote engine start). If this functionality is pushed to the AP, then another wake source to service the modem must be added. In the current design, the Integrator supplies a file with a list of wake sources to be turned off. The CPMS iterates through this file and manages the turning off and on of the wake sources at suspend time. OEMs must be careful to write applications so that they can be shut down quickly and not postpone the process indefinitely. 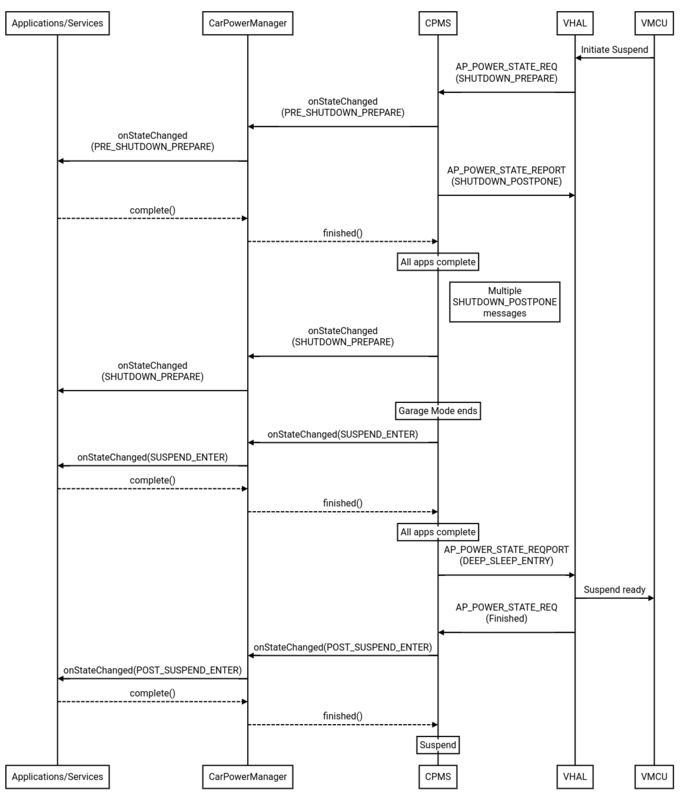 The following graph illustrates which objects have references to other objects. An edge means that the source object holds a reference to the target object. For example, VehicleHAL has a reference to a PropertyHalService object.